Go through the fundamentals of the GMDSS system and learn and practice a Mayday and a Panpan call and message. Understand the advantages of the DSC (Digital Selective Call) protocol and learn how to send DSC calls. Learn the phonetic alphabet and the correct use of the various channels. Understsand radio rules and regulations and how to make a call to another radio station. You have one year of time to study, and whenever you feel ready, you will be able to take a pre-test online. Once you have this pre-test behind you, you can then contact us to book the practical exam at our school. You can book directly online by clicking on the 'add to cart' button below. Or you are more than welcome to give us a call or send us an email and we will send you a confirmation back. Once you book your course, we will set up an online account for you and send you the access codes. 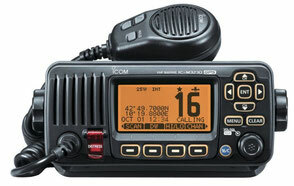 You will then be able to access the study material in form of the RYA VHF eBook and a very realistic Radio simulator.